“It’s time for the 90’s. It’s time for Klax!”. 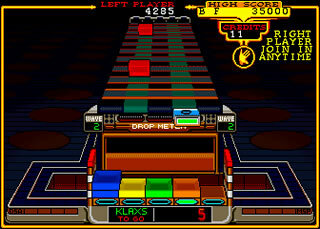 Released in 1989, Klax was one of those games that appeals to a wide section of gamers. A puzzler in the same ilk as Tetris and Columns, but just different enough. The game takes place on a grid of 5 on 5. Different coloured tiles come racing down the screen and you have to make lines in the 5 by 5 grid. To do this you have to move your paddle from left to right either dropping the tile, or flipping it. Flipping it throws the tile back up the play area, where they come back a little faster. Rather than constant gameplay like Columns or Tetris, instead you have to complete certain tasks. These tasks include horizontal, vertical or diagonal lines (or “Klaxes”, scoring points, or playing tiles), scoring points or even playing a number of tiles. Complete the set and you go through to the next “Wave”. Your paddle can hold 5 tiles, any more than that drop through, drop too many, or fill up the play area, and the game is over. Puzzle games are a little tricky to work in the arcades. Tetris wasn’t quite perfect in the arcade, largely because you were doomed to failure. Games that work need to have a beginning and an end. 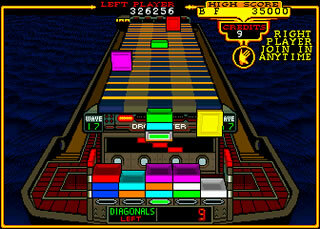 Games such as Puzzle Bobble, Qix and Klax work because they are level based. That doesn’t mean that this game is easy. On the contrary. Sure, it begins fairly leisurely, but it gets tricky very quickly, and things can go wrong very quickly. Furthermore, beyond the flip, there’s nothing really you can do. The only other saving grace is a Wild Tile, which becomes the colour of any other tile. But it soon goes incredibly crazy! Graphically this game is suitable at best. It’s not horrendous graphically, just it’s never going to set the world alight. In fact, the levels pretty much look the same play area wise, only with slight peripheral design changes. Music wise is sparodic to non-existant, with introductory music or syntahsised speech to welcome you to each level, and sound effects are sparse, but they are there – however depending on the version you play on, they vary between tolerable and downright annoying. That’s beside the point. The game is a tricky yet fun puzzler game in the same ilk as Tetris & Puzzle Bobble. It’s not quite as big and popular as those two behemoths of games, but nevertheless a fun diversion for a long time, perfect arcade material, and converted well to home consoles. Check this game out, but be prepared, it gets tough very, very quickly.